TimeTap helps businesses have organized appointments on their calendar & simple to understand availability for their clients to schedule with them. It's easy-to-use online scheduling that you can access from your tablet, smartphone, or desktop. Setting an appointment is easy from any device. With all the phone calls that come in, you’re feeling overwhelmed with too many things to do, too little time to do them, and a general sense of unease that something important is being missed. By using online appointment scheduling, you turn those missed calls, that full voicemail, and that cluttered inbox into an automated system. 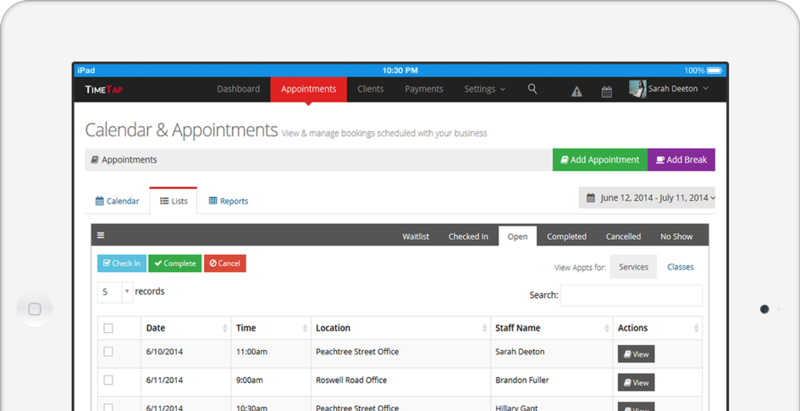 An all-in-one scheduling solution to move a client from thinking about making an appointment to happily serviced. With mobile friendly booking, your clients will be able to schedule with you whenever they're thinking about it & won't have to wait to get back to a computer. You've got enough to keep up with: family, projects, activities, the works. Online appointment scheduling is a simple & effective tool for your multifaceted & over-stressed life. With TimeTap, you'll have one less thing to worry about & keep up with. Schedule easily, wherever you are. Our mobile apps make managing your hectic life a piece of cake. It's impossible to have your computer with you wherever you go, but you often need to move things around at a moments notice. With TimeTap in your pocket, you'll be all set. Your clients carry their smartphones with them wherever they go. It's unrealistic to think that they'll remember to book with you when they get back to a computer. Let them book right when they think of it directly from their iPhone or Android. Once you set up your web scheduler online, download the mobile app to keep it updated on the go. What can I do with the mobile app? On our mobile app, you can check out your schedule for the day, add new appointments, create new client records, and view any of the classes you have set up. You can mark appointments as completed, no show, and cancelled and send out any emails regarding those status changes. When should I use the web app? Our mobile app makes checking your schedule, adding appointments & breaks, and looking up clients quick and easy. You will still want to login to our web app to do your main account set up (like adding your different services, configuring your scheduler, adding different staff, etc.). Once you get your account setup through the web app, the mobile app will be really useful for you & your team. Is there a mobile app for my clients? We don’t have a mobile app for clients, however our scheduling system is responsive when clients view it through their mobile browser. So, when clients visit your mini scheduling website when on their phones, your scheduler will reformat to fill their smartphone screens and allow them to book easily. How can I download your mobile app? If you have an Android device, you can download our mobile app from the Google Play store at this link. If you have an iOS or Apple device, you can download our mobile app from the App store at this link. The TimeTap team has been making online booking software since 2006. We’ve built TimeTap for all those businesses who have tried out other scheduling systems but have found them hard to use, unreliable, or not fully-featured enough. TimeTap © 2015-2018 Addy Systems LLC. All rights reserved.